I try to live by the creed of learning and making something good every day. As we have been pondering the holiday season it seemed a good time to get a jump on some leatherworking projects I’ve had in mind the past few months. 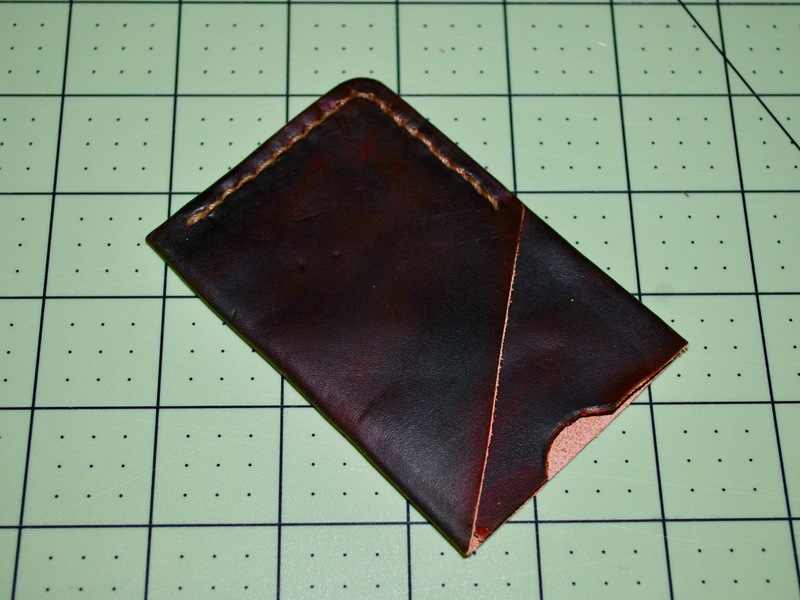 This morning, before getting to work on other chores, I decided to take a little time and work out a slightly modified Minimalist Wallet. 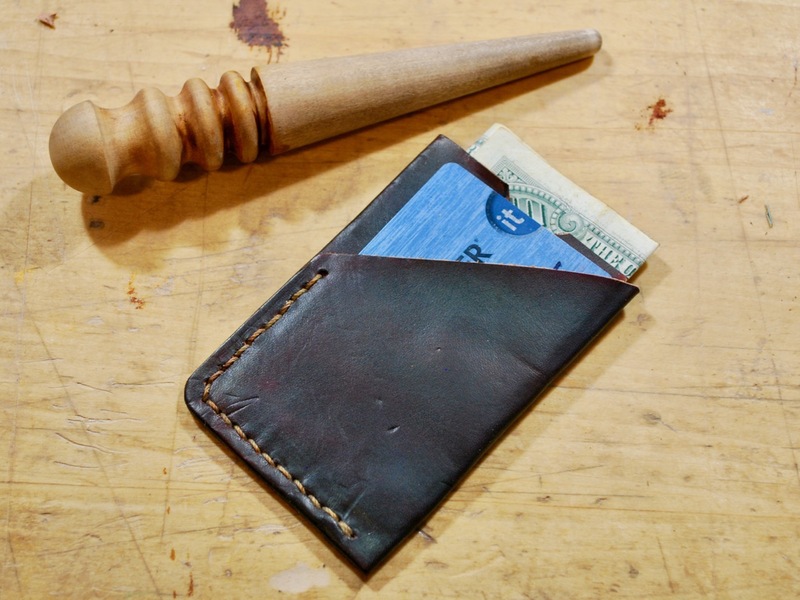 If you have followed this blog for long, you may have seen a couple earlier wallet projects we shared HERE and HERE. 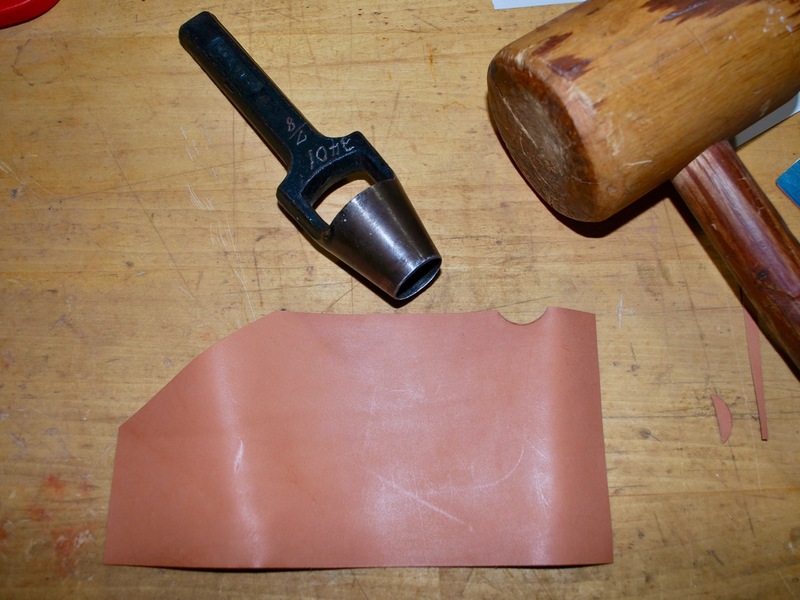 This isn’t a complicated project and might be a good one to start with if you trying your hand at leatherworking for the first time. It would be pretty optimistic to just dive in and start cutting out a wallet without knowing what needs to fit. 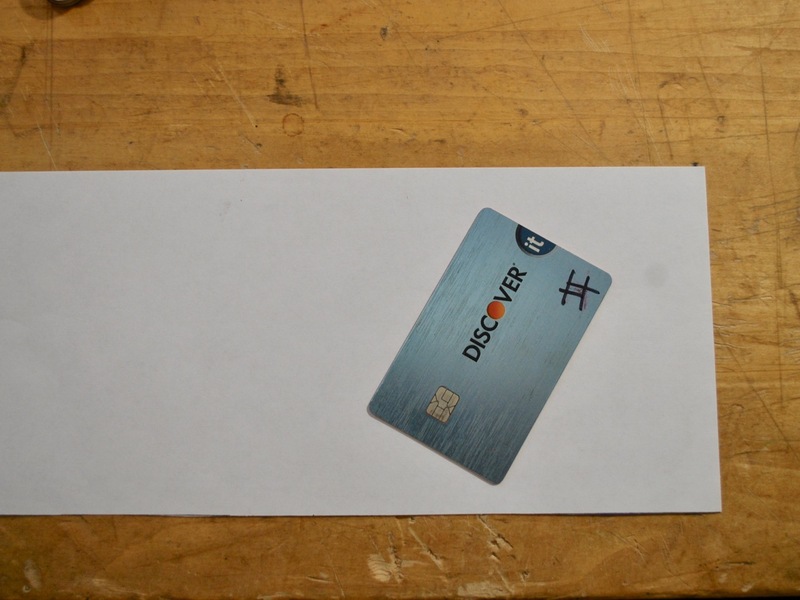 I used a debit card for scale as there will inevitably be a couple of these in just about any modern traveler’s pocket. I didn’t put a lot of time into the pattern as I have made a similar style before and knew the basics of what I wanted; essentially two pockets and very little sewing. 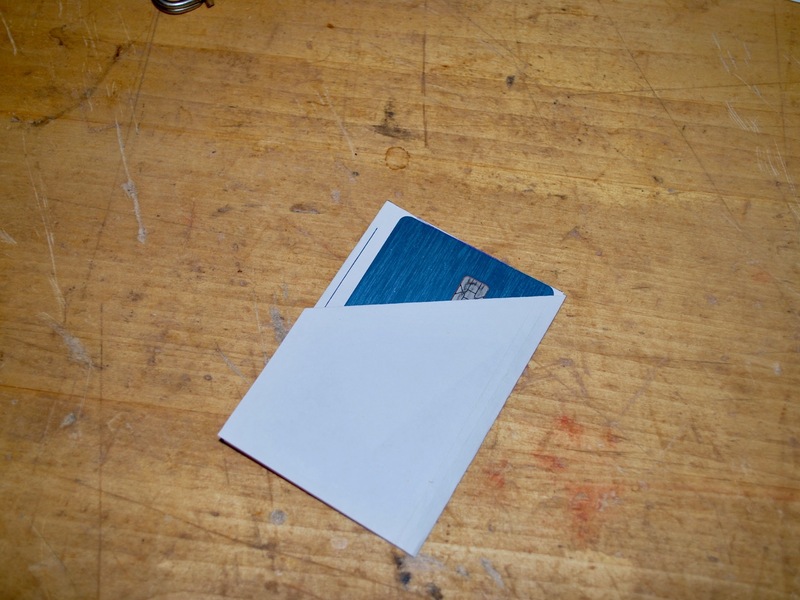 To create two pockets, there needs to be three layers; two on the outside and one to divide. To make the cards more accessible, the outer pocket will be a “reveal” and I chose to do this the simplest way possible, by a diagonal straight line. I ended up tightening the width and lengthening the entirety just a bit from my original estimates for a better fit. The difficult part is over. 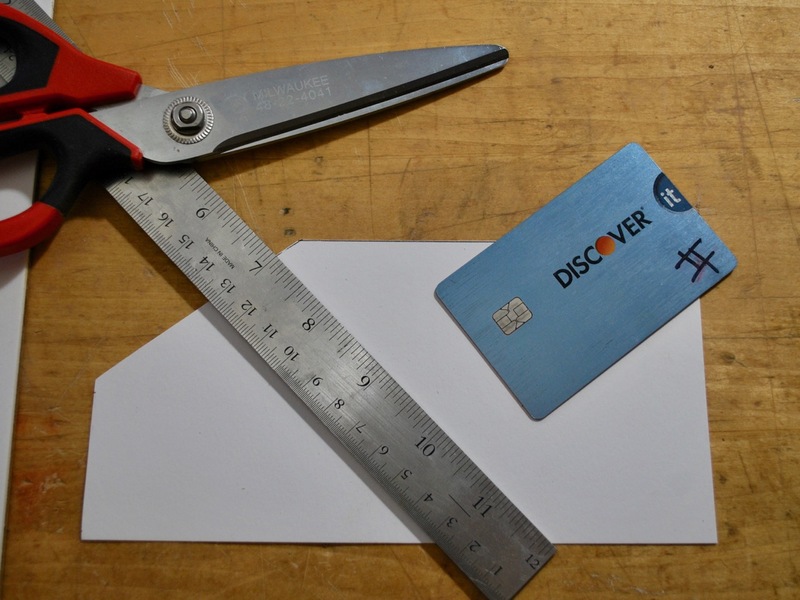 After the pattern is transferred to the card stock, it can be used many times without fuss. 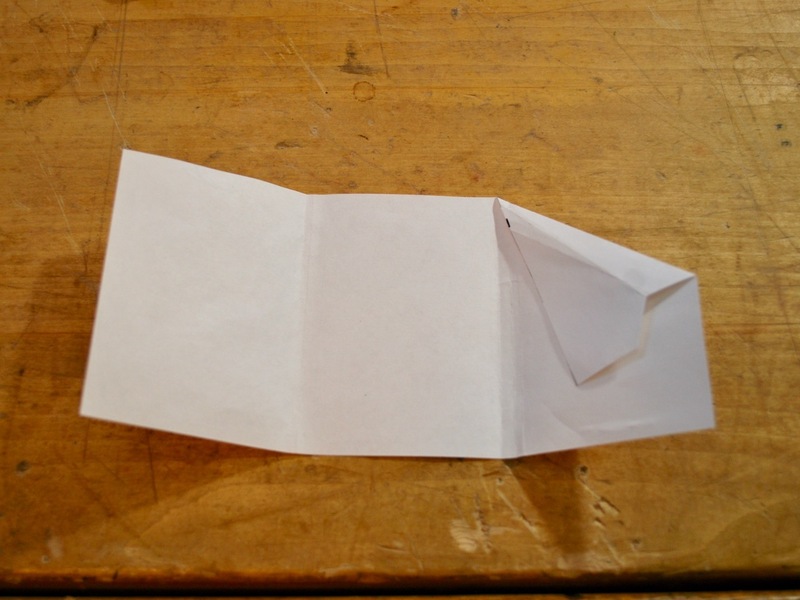 It is a good idea to label your patterns before storage as they begin to look alike when you amass a large folder of them (was this a pocket, part of a shoe, some sort of handle cover?). 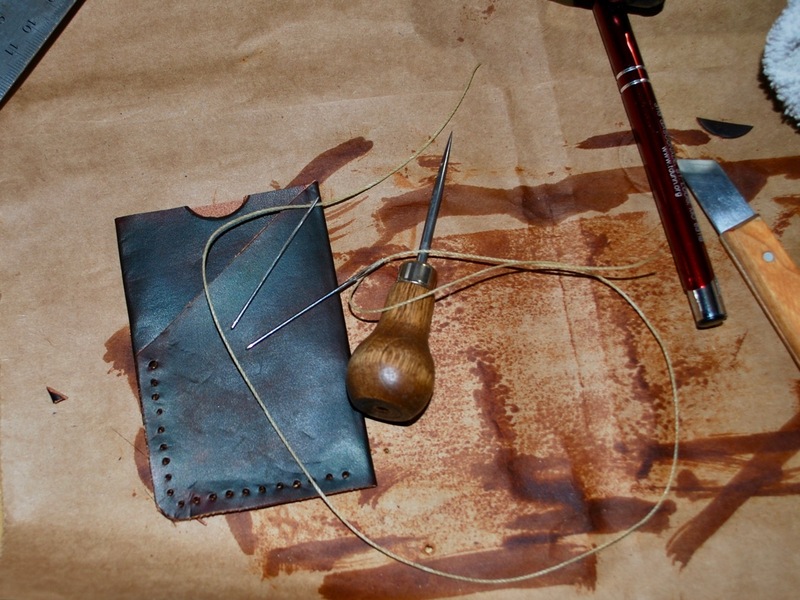 The next step is to cut out the pattern on appropriate leather. I’m using Hermann Oak 1.5 mm tooling side that was leftover from an earlier project. Neatness in cutting is very important as it will affect the look of the entire piece if the cuts are even a millimeter or two off or wavering in any way. Since most people seem to prefer dark leathers for this sort of thing I chose to dye it Medium Brown with Fiebings Leather Dye. After the dye sets you’re free to move on. I started by marking and awling the stitching holes at about a 5 mm increment. I will admit, this was not my straightest set of stitching lines ever. I almost always use a double needle saddle stitch when sewing leather as it is the best and strongest choice in most cases. I chose a contrasting thread to give it a fine finished look. 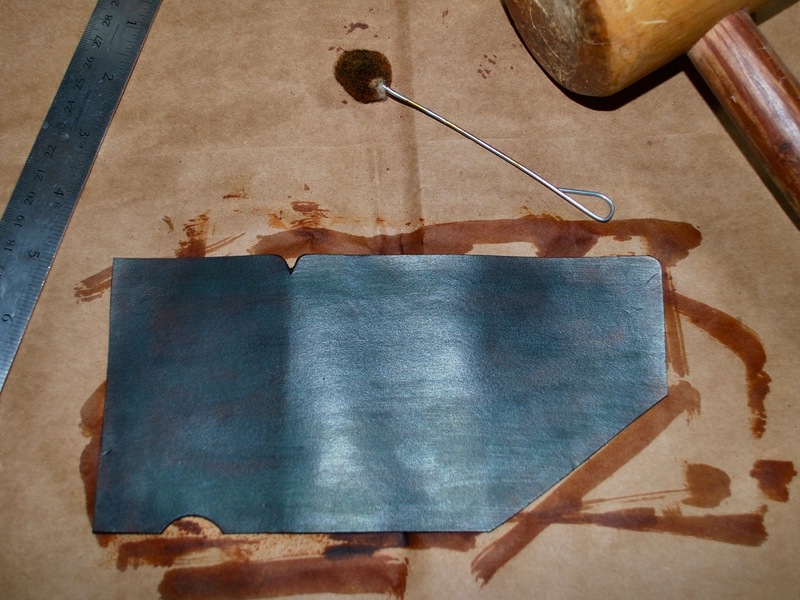 And finally, the edges were dyed again and burnished to create a smooth, finished look. Overall, I’m quite satisfied with the outcome. 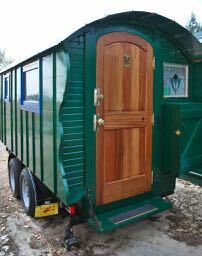 This one will be the prototype to work from and I’ll be able to take a little more care now that I have learned from this one. If I ever get around to making enough to sell, I’ll put them on my Etsy Store. I have a slightly more complex project laid out for later. If I take the time to document it, I’ll post it up here.